There are Austrians who advocate an ethics based on natural law and deductive rights, like Murray Rothbard. Then there are those who follow a pragmatic, utilitarian method. The Foundations of Morality is the outstanding culmination of the utilitarian tradition, eliminating the simplistic objections that have historically been made to it. 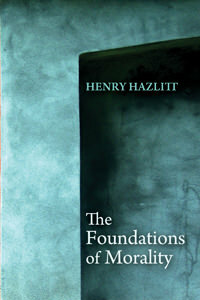 Hazlitt makes no reliance on abstract rights or religion, but rather starts with the principle that we each conceive, and seek the maximization of, our own happiness. He then shows moral rules as the outcome of an evolutionary process in a given society, and consent to such rules as being in each individual’s self-interest. While more famous ethicists like Rawls and Nozick ignore economic theory, the insights of Adam Smith, Mises and Hayek are thoroughly incorporated into Hazlitt’s work. If you're frustrated by most moral theories because of either their economic ignorance or reliance on suspect abstractions, I highly recommend this work.